Comodo SSL UCC DV was especially designed to secure your multiple domains and subdomains quickly and very cost-effectively. It ensures the security for both, your internal and external domains/subdomains, and is fully compatible with your Microsoft Exchange products and Microsoft Office Communications Server. 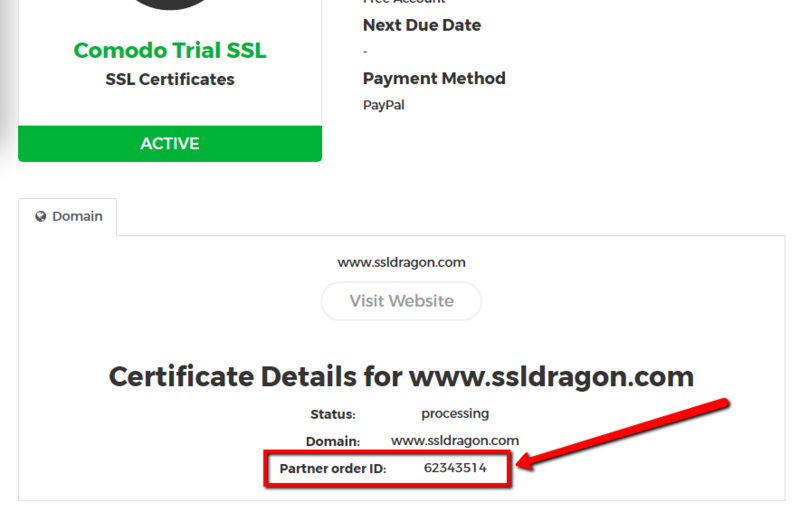 Compared to Comodo SSL UCC BV, where a verification of your business is performed, you do not necessarily need to have a registered company in order to request this Domain Validated (DV) SSL. The Certificate Authority (CA) will verify the ownership of your domain through an automatic email or file-based authentication. 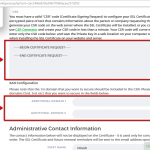 Following this simple verification, the CA will issue you the Unified Communications Certificate (UCC) SSL in a matter of minutes. 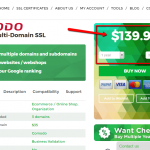 This SSL will allow you to secure 3 domain names at the price quoted in the cart. You can secure up to 210 domains and subdomains when purchasing additional SANs (Subject Alternative Name), which come for a very affordable cost. Comodo (now Sectigo) is the only brand in the website security industry to issue UCC SSLs capable of securing up to 210 domains / subdomains with one single certificate. Additionally to the 256 bit encryption strength and to the 2048 bit signature key, this Comodo SSL is compatible with 99,3% of all desktop and mobile browsers. It also comes with a $50,000 warranty from Comodo and the distinctive indicators of a secured website: the green colored “HTTPS” mark, the green colored padlock icon in the browser’s URL bar, and a static site seal. Your website will also benefit from getting a higher ranking in Google Search Engine, as a part of Google’s newest “HTTPS everywhere” policy. According to this policy, Google will give a priority on its search results page to websites which have an SSL certificate. For your full satisfaction, we offer you a discount when buying an SSL Certificate for 2 or 3 years, as well as a 25 days money back guarantee, in case you change your mind and you decide that you want a different SSL Certificate. 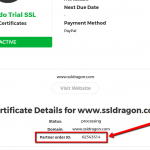 Comodo SSL UCC DV is the ideal solution for securing your blog, personal website, and your small or medium business website, when you need a quick Domain Validation SSL Certificate. I have three blogs in different niches, so this certificate comes in handy in encrypting all my sites. 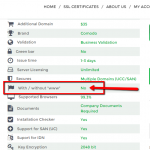 Chose this multi domain ssl with basic validation because it offers a bigger warranty.